The new and shiny Meetin.gs mobile application for iPhone, iPad and iPod Touch is out! 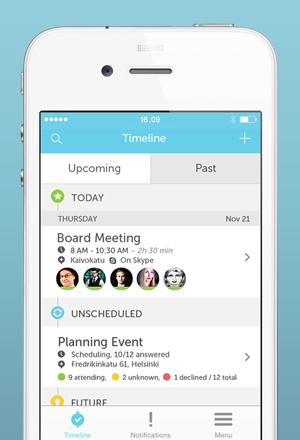 The new version introduces some amazing new features to keep your business meetings organized. In this post I will explain the changes and improvements as well as upcoming features. The whole application is basically a complete rewrite with a reimagined user experience. Focus was especially on speed and usability. It is also more in line with the desktop version. The old version was often slow to load and required multiple steps to complete a specific task. The completely redesigned version is snappy and straightforward. We are pretty happy on how it turned out as all of the loading times are considerably reduced. The timeline as well as the whole application went through some major reorganization. Usability was our top priority. We wanted to clean the timeline and make it easier to find what you are looking for. Past and upcoming meetings are now separated in their own tabs. There is a new section for notifications in the application. Meetin.gs finally has push notifications. 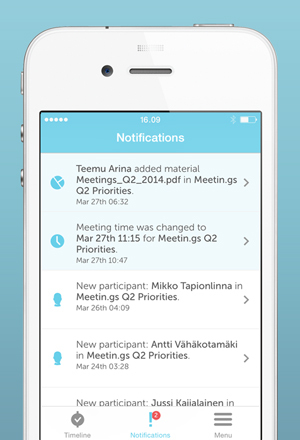 This version offers push notifications for invitations, RSVP, new materials and comments, changes in meeting information e.g. time, location, participants etc., meeting requests, and invitations. More notifications will be introduced in upcoming updates. You will be able to set which kind of notifications you wish to receive via email and which ones as push notifications on your mobile device. Finally you will be able to cut down the number of emails you receive about meetings. Notifications are shown in the iPhone Notification Center as well as inside the app itself. In the next versions of the application we will bring the mobile optimized Meet Me pages and schedulers, as well as extended support for Live Communication Tools. Scheduling your meetings on the move will be easier than ever before. Oh btw., this is our new shiny website. See our frontpage to learn more.